When it comes to building an Ethereum mining rig (or any mining computer actually), it’s all about making money. If you’re into it for more than just a fun experience, then you need to know how much it costs to run your mining rig, and compare that to how much money the coins that you’re mining are worth. Power is a real expense that can easily be overlooked when first starting to consider mining. After all, running a computer doesn’t take that much electricity, does it? A typical computer, no. But what we’re building is a multiple GPU system that will be on 24/7. Even just mining with a single GPU setup, with a card drawing around 100 W of power, can cost almost $0.50 per day (depending of course on the cost of power where you live). At any rate, when you’re mining around $4.00 worth of ETH every day, $0.50 is a decent chunk of that and it can really cut into profitability when you take into account the cost of the mining rig. Besides just monitoring electricity usage for overall profitability calculations, it’s helpful to use the electricity monitor to tune your GPUs into the best mining speed/power usage combination as possible. For my GPU mining rig, I plan on dual mining ethereum and tweaking the 1060 card to give me the low power/high hash rates that Legit Reviews was able to get. They lowered their power target to 45% and they were able to min at 22 MH/s using only 65 watts of power! In fact, their power usage was so low that the GTX 1060 didn’t even turn on the fans. This is ideal for me as my mining rig will be in the corner of my office – I don’t want to have to wear ear plugs, and I don’t want to listen to wind tunnel noises all day long either! Here are some of the best energy monitors that you can use to give your mining computer the best profitability. 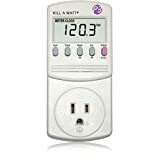 The great news is that these electricity usage monitors don’t cost very much, and you could use a single unit on different machines and even other appliances in your house. 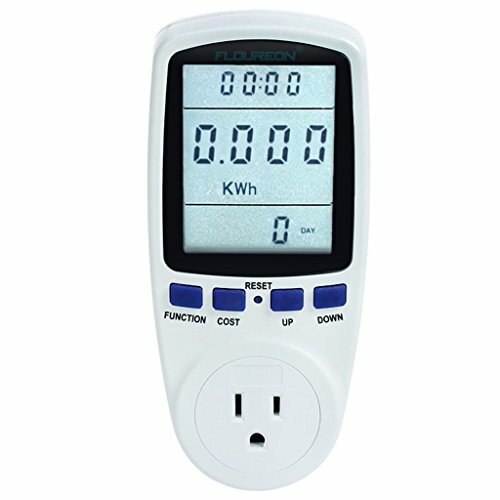 If the Kill-A-Watt design is too old fashioned, or if you’re concerned about the usability of the single line LCD display, check out this power monitor by Floureon. It’s one of the easiest to use versions we’ve seen, and, likely since it doesn’t have the name brand backing of the Kill A Watt systems, the price comes in a little bit cheaper even! With a built in battery backup, you can move and view the meter without losing the readings. It has a clear, large LCD display and can calculate your actual dollars and cents costs based on the cost of electricity that you input. 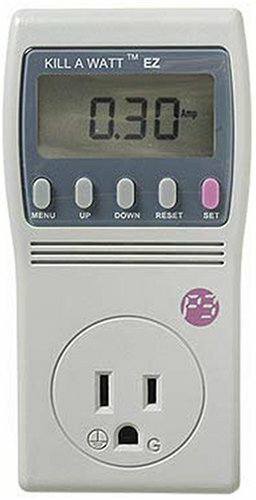 The power usage meter measures power (watts), energy (kilowatt hours), volts, amps, hertz, power factor, and maximum power draw (in watts). Accuracy is only within 3%, though, so if you need something better, the 0.2% rating of the Kill-A-Watt meters is definitely hard to beat! I’ll be buying this meter for my Ethereum Mining Rig Build since I don’t need to be razor specific in my calculations. If I was building out a mining farm, then I would spend more money on a commercial-rated electricity usage monitor. 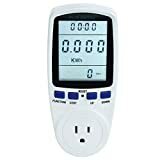 This is the newest model of electricity meter from Kill A Watt (P3 International), but it is slightly more expensive than the older version. The revised version has the capability to forecast power cost for the week, month, and even a yearly basis. As with the older model, it has a built-in backup of saved and accumulated information for review and averaging calculations. It is accurate within 0.2%. The power usage monitor also monitors line voltage, line frequency, and power factor to help detect voltage drop and brownout conditions before they can cause damage to your equipment. The meter is set up to handle a max 15 amp current (so about 1875 watts), so make sure you don’t connect more than one mining rig at a time downstream of this. There are many people who have tried using it to monitor things upwards of 1200 or 1300 watts and they have melted this meter… as with everything in life, use your brain and be safe! This is the most widely known best energy monitor on the market. 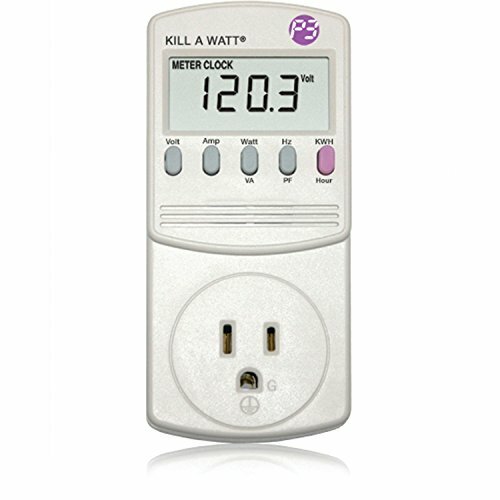 The Kill-A-Watt electricity monitor first came on the scene when the manufacturer published information on phantom power. When building a mining rig we don’t care about phantom power – we don’t every want our rigs turned off, so we are just concerned with power draw when mining. Using the kill-a-watt electricity usage meter we can get a reading on how much power we are using to calculate the cost vs profit of our mining rig. This power meter doesn’t just show you the power being used, it actually tallies the total amount used over a period. So, for example, you could start your mining rig, reset your power meter, and then check back in a week to see the total power used. Compared to the amount (and value) of ETH coins mined you can calculate your profitability.